The continuation big block Daytona Coupes follow the same specs as the Ohlsen modified racecar. 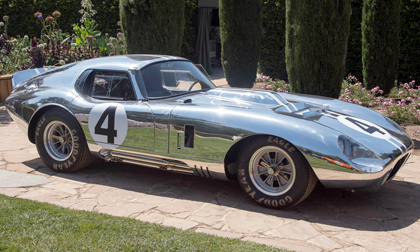 All Daytona Coupes will feature an aluminum body that can be painted in any race livery. Each continuation Coupe will feature a 3-inch lengthened chassis and hood to accept a powerful aluminum 427 medium-riser big block motor, which will be supplied by the Shelby Engine Company. The powerful 550+ horsepower engine will be mated to a period-correct 4-speed manual transmission. Each will be assigned a ShelbyCSX2000 series serial number for documentation in the official Shelby Registry. CSX2603will debut in polished aluminum bearing the number “4” and sporting a pair of white stripes with a single blue between them. This is the number and stripe scheme that CSX2286 would have worn for the 1964 Le Mans. It will be displayed at the Rolex Monterey Motorsports Reunion located at Mazda Raceway Laguna Seca from August 18-20, 2017. For more information or to learn how to order one of the six continuation Daytona Coupes, please call visit www.Shelby.com or call (702) 942-7325.